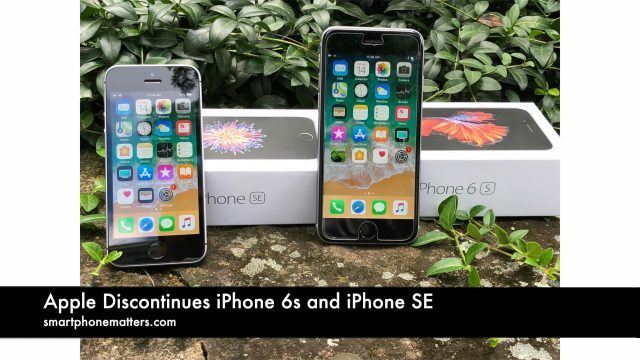 On September 12 2018, Apple discontinued iPhone 6s and iPhone SE. Or at least they no longer have them for sale on apple.com. If you take a look at apple.com, Apple now sells the iPhone Xs, iPhone Xs Max, iPhone Xr, iPhone 8, iPhone 8 Plus, and iPhone 7, and iPhone 7 Plus. Now, the least expensive iPhone Apple sells is the iPhone 7 for $449. That is $100 more expensive the iPhone SE was and the same price that the iPhone 6s was selling for a few days ago. If you read smartphonematters.com or watch my YouTube channel you know that the iPhone SE and iPhone 6s were very popular with prepaid wireless customers. I recently bought a brand new iPhone SE from Simple Mobile for just $84! And that came with a $25 service plan. That was $265 less that what Apple retails the phone for. More recently the iPhone 6s and 6S Plus could be found at highly discounted prices. Now, of course there is one difference in that the highly discounted iPhone models sold by prepaid companies are carrier locked for use on their networks compared to the SIM-free unlocked iPhone models from Apple. I am hoping to see the tracfone brands start selling the iPhone 7 at highly discounted prices. With the iPhone 6s and iPhone SE, they would offer these phones at a discounted price and then you could save up to an additional $100 on the phone with a phone and plan bundle. If they offer an iPhone 7 at $349 or less that would be a great deal. Many people had asked me if I thought Apple would do an iPhone SE 2, which was rumored for months. Supposedly this would be a 4″ iPhone with an iPhone X like notched edge to edge screen. I never really bought into that rumor and I beleive Apple is done with 4″ iPhones. Finally, with the iPhone 6s and iPhone SE gone, Apple courageously say good bye to the headphone jack. Rest in peace headphone jack… we miss you. What about you? Will you missed the Phone 6s and iPhone SE? Leave a reply below and share.